Deregulation of diesel and fertiliser prices and the issue of foreign direct investment in rail and defence on Wednesday drew fire from West Bengal Chief Mamata Banerjee, who said Trinamool Congress would raise the matter in Parliament. Holding her party would oppose any ‘attempt to sell out the country’, she claimed that in the past five months, the Centre had done nothing ‘good’ and that ‘Bharatiya Janata Party is only busy beating its own drum in the social media’. Addressing a meeting of party workers at Pailan in South 24-Parganas district as she kicked off district tours from Wednesday, Banerjee said, "The Centre has hiked FDI in defence. The Centre has no faith in our own scientists." Banerjee said that by lowering the price of diesel a little bit, the Centre was trying to hoodwink the people and warned that ‘in the long run, people would suffer due to the deregulation of diesel price as there would be a rise in the prices of petroleum products’. "Diesel prices has come down drastically in the global market. “Have the prices come down in India in a proportional manner?" she asked, adding, "When a man opens a new shop, he offers concession in prices for some days only to increase it later." "The lowering of the price of diesel is nothing but a temporary phenomenon," she asserted. The Chief Minister said the Modi government wanted Mahatma Gandhi National Rural Emplyment Guarantee Act restricted to a few blocks. "Why would other blocks suffer?" she wanted to know. Urging that West Bengal should get the Centre's ‘special attention’, Banerjee said, "Bengal needs financial attention. "Thirty four years of Left rule has crippled its economy. I had appealed to the previous government but they have not done anything. The present government has also not done anything in this regard so far." She said, "India has a federal system. But are the states economically autonomous? "Delhi took away the major part of our revenue." Banerjee took credit for enacting the Fiscal Responsibility and Budget Managament Bill after coming to power and blamed the previous Left Front government for incurring huge debts which the present government was having to pay. Alleging that a section of the media was spreading canards to malign her government on various issues, she said, "I have no problem if a section of the media resorts to slandering against me. "But I will not tolerate any insult to the people of Bengal." 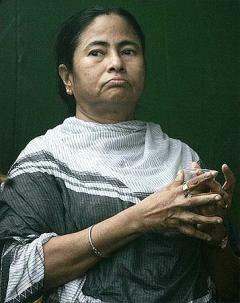 The Chief Minister said, "Now that BJP is in power at the Centre, they are trying to incite riots in Bengal. I will not allow that as long as I am alive. "During the Left rule, Communist Party of India-Marxist used BJP to split opposition votes, so that they could win," she said.